"The rabid Golden Rice lobby group, Allow Golden Rice Now! has left the Philippines with their tails behind their legs, and cowed by the intense resistance showed by the farmers opposing the unsafe and unwanted Golden Rice," the March 11 release stated. Masipag officials said pro-Golden Rice lobbyists further ignored Filipino farmers' invitation to challenge them to a discussion regarding the dangers of GMO crops, adding that farmers "will be among the first to be exposed to the potential harms of Golden Rice." The Allow Golden Rice Now!, a lobby group based in Canada, toured the Philippines from March 3-10 to campaign for the adoption of the genetically modified 'Golden Rice.' The said visit is part of their Asia campaign tour, in which they will also travel to Bangladesh and India to promote Golden Rice. Headed by Patrick Moore, the group peddled the genetically modified rice while demonizing the farmers and other sectors who have expressed their opposition to the Golden Rice. "It appears Patrick Moore and his cohorts chose not to face the farmers in a debate because they know that they will be exposed as frauds and agents of disinformation," said Dr. Chito Medina, National Coordinator of MASIPAG. "Instead they sneak around the country spewing misleading claims on the technology, and even on organizations that are critical to Golden Rice." The Filipino group said that Golden Rice has been genetically modified to express beta-carotene, which is a precursor of vitamin A. 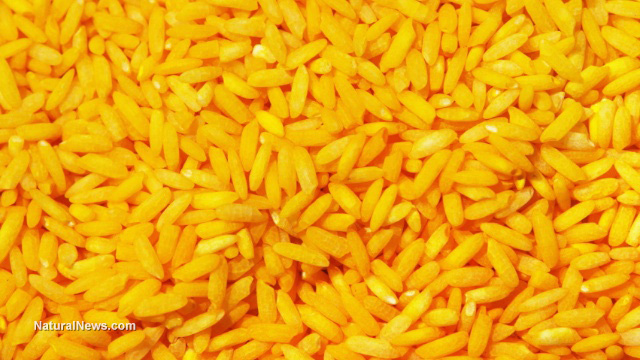 Golden Rice, developed by the International Rice Research Institute (IRRI), is supposedly designed to address vitamin D deficiency in developing countries. But resistance to it has grown steadily in recent years, to the point where some 400 local Filipino farmers found and destroyed clandestine Golden Rice trial fields planted in Pili in August 2013. Most, it seems, reject the agricultural imperialism being foisted upon them by global biotech giants looking for new markets. "Instead of heeding the farmers call to stop Golden Rice, and focus on other means to address VAD, Golden Rice proponents paint the political action as 'vandalism', and the rejection of the GM rice as a 'crime against humanity'," said Medina. "When, in fact, the real crime being committed against humanity is subjecting rice, staple food of 60 percent of the world's population, to an unsafe and potentially harmful technology such as genetic modification." Masipag said that more than 70 farmers from the Quezon, Nueva Ecija and Pangasinan provinces descended on the Philippine Department of Agriculture in March to call for a countrywide ban on the introduction of Golden Rice. The farmers said there were already growing enough foods rich in vitamin A, making the GMO Golden Rice unnecessary. "We cultivate a number of vegetables and fruits that are safe sources not only of Vitamin A, but also other nutrients that our body needs to be healthy," said Lolit Saberola, a farmer from Tayabas, Quezon, according to the Masipag press release. "As a mother, I would not want to expose my children and grandchildren to Golden Rice." "Golden Rice is a simplistic solution to a complex problem," added Cris Panerio, Regional Coordinator for MASIPAG in Luzon. "Vitamin A Deficiency and malnutrition [are] caused by the lack of access to safe and sufficient food, which obviously cannot be solved by Golden Rice."